A Table Top Mist Fountain Styled Like a Bowl of Ice. This wonderful little water feature would make a unique addition to any home or office. It is similar in function to the rest of our misting fountains, but this one features styling that makes it stand out from the rest. It has the look of a bowl full of ice cubes, but there is no ice or dry ice involved. A simple glass bowl sits atop an understated glass stand. The bowl is piled full of glass cubes made to look like real ice. Underneath the cubes is where the magic happens. The mister with 12 color changing LED lights sits submerged in water all the way under the pile of cubes. Once turned on the bowl and ice will appear to change colors as a misty fog starts to billow out from under the ice. 16 different lighting modes will automatically cycle to create an ever changing focal point that would enhance the decor of any room. There are no special chemicals or procedures necessary to operate and enjoy this fountain, simply turn it on and enjoy the relaxing light display and natural cloud of mist. The Ice Cube Mist fountain is more than just something cool to look at. It also has many other added benefits that you will be able to take advantage of. It will act as a humidifier, air purifier and fragrance diffuser too. As it operates, you are basically creating a natural cloud of water vapor, so as it floats about, it is actually adding moisture to the air in the room just like any of those traditional cool mist humidifiers do. This makes it ideal for dry winter or summer air, for use in children's rooms or even to support the health of house plants. As mist is produced, the unit will be generating negative ions too. These will disperse into the air in order to neutralize pollen and other contaminates and clean the air. People with allergies, respiratory problems and other sensitivities will especially benefit from this feature. If you add a few drops of essential oil to the water, the Ice Cube Mist Fountain becomes an aroma diffuser. Any fragrance added to the water will be diffused into the air as the mist is made. It is quite an efficient process, so in very little time, you can add noticeable aroma to any room. It is much healthier and more effective way to make your home or office smell good than using traditional deodorizers and sprays. This feature is ideal for anyone, but especially favored by masseuses and other natural health practitioners. This misting fountain has an average sized bowl, and is comparable in size to most other table model fountains. This means that it will fit conveniently almost anywhere. All of the parts are high quality, and besides the electronics, this model is completely made out of glass. The addition of the decorative ice cubes give it a great look, and will ensure many compliments and questions from family and friends. Once you turn it on, natural fog and mist will start to form beneath the cubes of ice. It will continue until the bowl is full, at which point the mist will begin to float away gently. To add to the effect, 12 color changing lights will illuminate the mist, and refract through the glass cubes to create an amazing looking decoration. Soothing water noises will also accompany the mist production and light show to enhance your space and relax your mind. A table top fountain perfect for almost any space. Glass cubes fill the bowl and appear to change colors as a natural cloud of mist is produced. Order Yours Today! 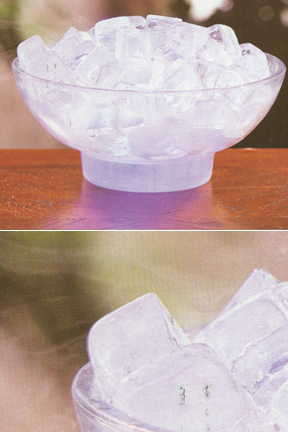 Will the ice cube misting bowl allow you to turn the lights off and mist only? You will need a controllable mister to have this functionality. This model comes with an auto-changing unit, so you would have to upgrade to run it without the lights on.